Using GIS, a common operating picture is provided on tablet computers, smartphones, and wall monitors. ArcGIS for Server integrates and presents diverse CAD, GPS, and enterprise emergency incident information. In fire departments across the United States, emergency calls are received by the dispatch center, which transmits and coordinates critical information to response units. Fire incident commanders responding to the incident and on the scene must take down essential information transmitted to them via radio, jotting it down on notepads or even on their hands. In some instances, they don’t have the critical information that the dispatchers have at their fingertips to manage operations or incident responses. A couple of scenarios illustrate the current inefficiencies in fire incident response. In Alameda County, California, as in fire stations across the country, battalion and division chiefs are responsible for several fire stations, with multiple units in each station, as well as providing backup when the primary battalion/division chief is responding to an incident. Hard-copy binders are used to reference detailed site plans. This detailed information may not be available when a backup battalion chief is in charge and needs access to full information about an incident scene. When service areas go empty due to resource assignments, second chiefs step in to make operational decisions depending on remaining resources. Unfortunately, they cannot easily see the status of all units because they do not have access to this information in a visual and easily understood format. 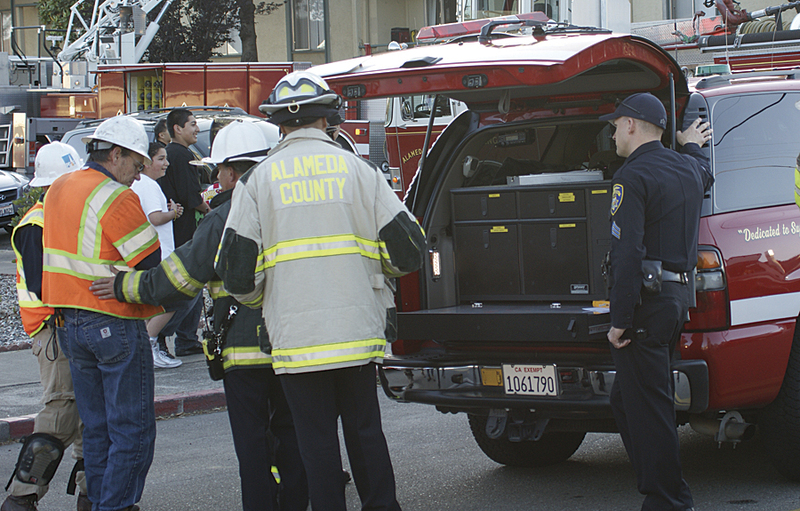 The Alameda County Regional Emergency Communication Center (ACRECC) is addressing this inefficiency in fire incident response by implementing SitStat—Situation Status. 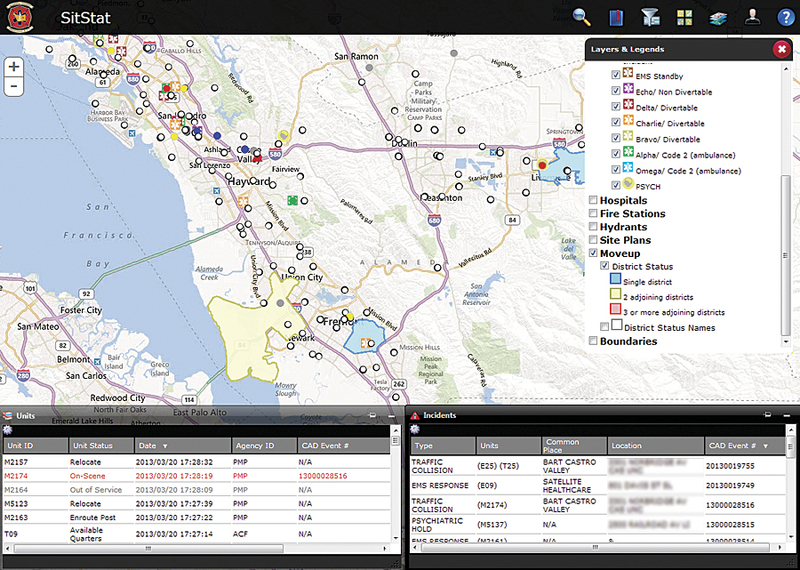 SitStat addresses the shortcomings of existing procedures by dynamically showing the location of all emergency units and their availability throughout the entire Alameda County area. When at an incident, the SitStat user can zoom in to the incident on the map and see the location of each of the response units and the conditions in the surrounding area. Site plans can be opened with a single click. This rich interface is intuitive and provides the incident commander with key information for decision making. Implemented with Esri technology, a common operating picture is provided on tablets, smartphones, and wall monitors. ACRECC is deploying the application to serve its several fire stations and agencies in Alameda County, about 50 miles southeast of San Francisco, California. ACRECC turned to Esri Silver Partner Psomas of Riverside, California, to implement SitStat because of the firm’s expertise in Esri software design and implementation, experience and understanding of emergency management business processes, and involvement in deploying enterprise GIS at Alameda County. Working as part of an integrated project team, Psomas provided overall project coordination and managed the design, development, and deployment of SitStat. The dashboard displays units, incidents, and station move-up analysis results, alerting a chief to possible resource concerns. Overcoming difficulties in data collection—The data collection process was extensive and complex, including the need to integrate with ACRECC CAD, get current site plans from the fire agencies, and ensure multiagency coordination for training and deployment. Ensuring security—It was a challenge to manage access control, data transmission, and firewalls, integrating secure and nonsecure information for the multiagency ACRECC organization. Supporting multiplatforms—As a regional system solution, SitStat must operate on various devices used by the participating agencies. The application must work on Apple, Android, and Windows devices on desktop, tablet, and phone screen sizes. Four different browsers are supported, as well, which required extensive functional testing to ensure all combinations of devices and viewers work consistently. Managing multiple interests—The multiple participants involved (dispatch, CAD vendor, technology host, fire leads, GIS implementer) each had specific responsibilities and proprietary interests. As a result, the project required significant coordination among the stakeholders to ensure system integration, security, and reliability. With SitStat now in place in fire stations throughout the 738-square-mile ACRECC area, all emergency responders act with the same set of information. They now have a common operating picture showing real-time information to everyone who needs to know. The rich content includes GIS layers featuring hospitals, fire hydrants, station area coverage, and jurisdiction boundaries, along with several basemaps, including topography, streets, and aerial photos. Scott Doan is a division chief of the Alameda County Fire Department. Craig Gooch is vice president for Psomas, Spatial Technology Solutions. For more information, contact Scott Doan, division chief, Alameda County Fire Department, or Craig Gooch, vice president, Psomas, Spatial Technology Solutions.